Most web host providers have either one of them. Then search for one of them in the Category 'Software / Services' and click on its icon or name. 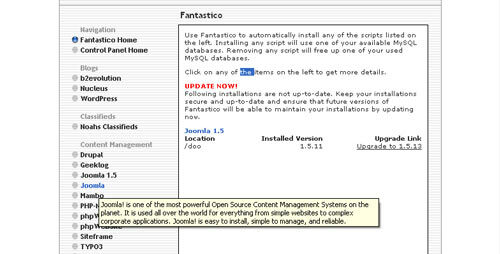 On the left hand side of Fantatsico there is a 'Content Management' Category under which Joomla! is there. Fill in the various details and Submit. There will be some three odd steps. Just keep on clicking Submit! In Softaculous there is a 'Portals/CMS' Category. Collapse the category and Joomla will be there. 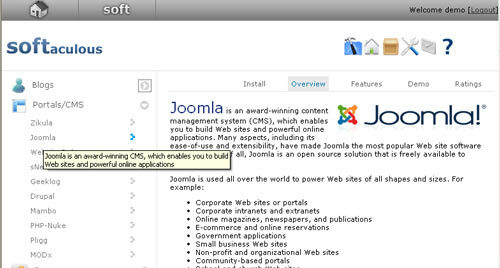 Softaculous supports only the latest version of Joomla. Fill in the various details. You will have an option to import Sample Data. This smaple data is the Sample Data given in Joomla. After completing the Details click on Submit. Thats it you are done, Softaculous take only one step. Its really fast to install and update using Auto Installers. This page was last modified on 5 November 2018, at 02:41.